If you want to configure Solr4.0.0 in Windows environment please click here. In this blog i will tell you how to integrate Solr4.0 with apache-tomcat 7 in linux environment. Before we start i recommend you to read an Introduction of solr4.0 from here. 4 ? Apache-tomcat 7 or Above. Install Tomcat on your machine and and make sure it is ready to start. Install Solr4.0 distribution package apache-solr-4.0.0.tgz and unzip it in your local directory like /home/javaguys/apache-solr-4.0.0. Make a folder with name solr-home in your local machine like /home/javaguys/solr-home. Go back to the solr distribution package that you downloaded /home/javaguys/apache-solr-4.0.0. Have a peek inside the Examples folder. Copy all those files into the /home/javaguys/solr-home folder. Look into /home/javaguys/solr-home/solr and you will see two folders with name collection1 and bin, copy these two folders a step up to /home/javaguys/solr-home. Look into /home/javaguys/apache-solr-4.0.0/contrib/extraction in downloaded solr package and you will get a lib folder here , copy this folder to /home/javaguys/solr-home. Copy apache-solr-4.0.war from /home/javaguys/apache-solr-4.0.0/dist directory to webapps directory inside Tomcat. Start your Tomcat and check webapps directory having one new directory added with name solr. uncomment the entry and add your solr-home path /home/javaguys/solr-home to value tag. Add your new libraries location to /home/javaguys/solr-home/collection1/conf/solr-config.xml. just under <config> tag like <lib dir="/home/javaguys/solr-home/lib" />. 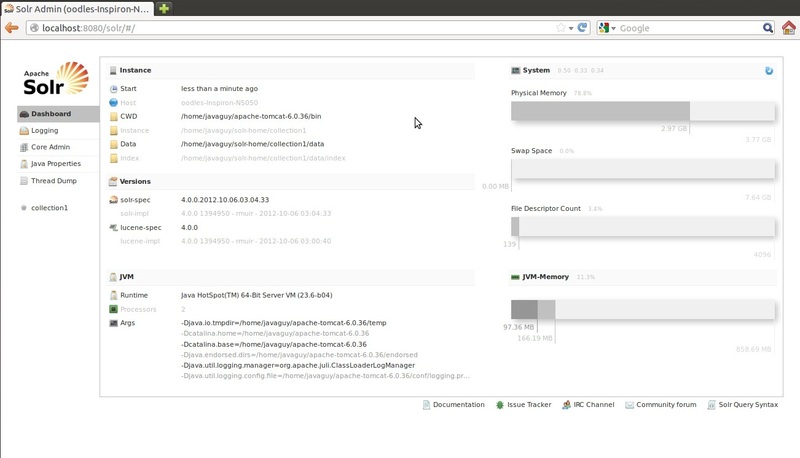 And you are all done with it , start your server to localhost:8080/solr and you will get your solr admin panel up. In upcoming blogs we will see how to make queries to solr server and other important stuff with solr 4.0.0.